Comfortable wave style with round cut handles, extra wide opening for quick and easy loading, flat bottom to prevent spills. 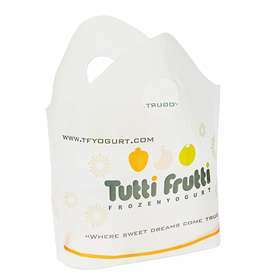 We can imprint your business name, logo or design in up to 6 colors on wave top bags. It's the most cost effective advertising you can do. If we don't stock the size you need, we will have it custom made for you. 5 Day rush production avail. Don't have space in your restautant? We will stock it free for you. Custom Sizes Available - REUSABLE THICK OPTIONS FROM 2.25 MIL TO 4MIL GAUGE ARE AVAILABLE TO MEET BAG BANS. Prices include one color printed on 1 side & bag additional imprint colors (up to 5) avail. Over 25% coverage, contact us for a quotation.